I love it. But no, I didn’t celebrate my 4/20 reduced to 1/5 traditionally. I went to the comic book store (@comicbookjones), picked up 3 months of comics, came home, then fed the kids McDonald’s dinner, I abstained!, and then I slept on the couch on my @brooklynbedding pillow. This thing is amazing. Today has been awesome. This should be good. I like the drive to the airport. I’m a weirdo who actually likes airports no less. Maybe I’m due for a vacation? Probably, yeah. It’d be nice. But while I’m sitting here thinking and getting ready to go, let’s check in for the night. First: I’m not hungry. I’m tired. I’m starting to listen to my internal cues. Next: I’m still nauseous but I haven’t puked. I think I’m going to drink a broth before bed. Man, I’m getting sick of broth. I do however have a Powerade zero for the trip tonight. I’m gonna put it in my camelbak- I have to scrub it tonight anyway. And last, I went over carbs but way under calories today- the nausea causes anorexia but that’s part of the medicine working. It delays gastric emptying and disables your ghrellin production so you literally aren’t hungry. I’m fat enough where it’s not the end of the world, but I’ll try to eat real food again when I come home. Ok world. 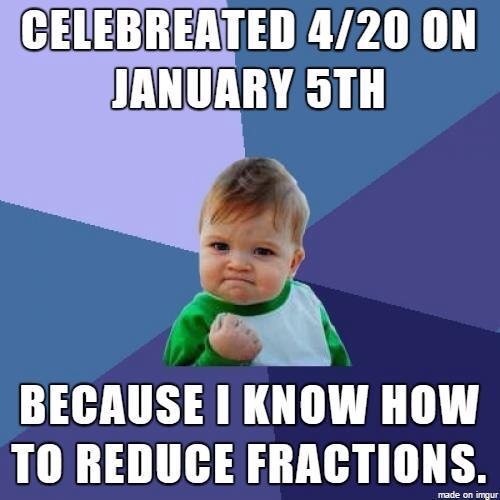 Enjoy your fractions!